View More In Book Lights - Page 5. Easily illuminate your work space or desk with the CREE LED Magnetic Light By Stalwart. 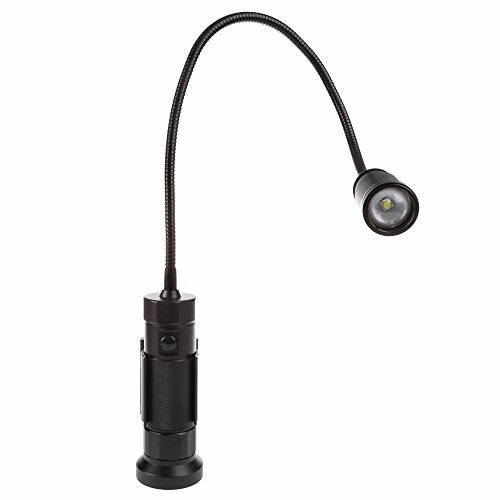 Featuring 550 lumen, 2 powerful magnetic bases for dual attachment options and a flexible goose neck this portable lamp is ideal for a variety of purposes. So whether you need to brighten up your workbench or need a reading light at your desk, this lamp will fit your needs! PORTABLE, ADJUSTABLE- With no cords, this LED lamp is portable to take with you wherever you need to go. Also featuring a flexible arm gooseneck design, this battery operated cordless light is fully modifiable to your lighting needs and allows you to focus the light exactly where you need it. MULTIFUNCTIONAL LIGHT- The magnetic lamp includes 2 powerful magnet bases, allowing you to use this light for multiple purposes and attach it to multiple magnet-compatible surfaces. Each base takes up little space in your work area, so it can easily be used as a worklight, a reading light or as a desk lamp. It is also perfect for college and university students who need small-space lighting. ENERGY EFFICENT LIGHTING- This 550 lumen multipurpose light utilizes CREE LED technology which helps to save on energy costs compared to traditional lighting. CREE LED lights lead to an improved lumen-per-watt ratio and are proven to have a longer lifespan than traditional lights as well! If you have any questions about this product by Stalwart, contact us by completing and submitting the form below. If you are looking for a specif part number, please include it with your message.